Gold was discovered in the area of Ballarat in 1851 and the district, was surveyed by W.S. Urquhart in 1852. The Municipality was created on 18 December 1855, the Borough in October 1863, and the City, on 9 September 1870. The name 'Ballarat', originated from 'balla', the Aboriginal for 'elbow'. Hence, 'Ballarat', was a place where one 'rested on one's elbow', or was a 'resting place'. James Oddie commissioned this work in 1884, and in a letter to James Smith, dated 29 October 1884, the artist gives details of the town as depicted in his painting. Eugene von Guerard, further notes that 'on the right hand side some diggers are being escorted by police to the lockup at the Commissioner's Camp for not having diggers' licences'. Their arrest was one of the chief causes of the Eureka riot in 1854. 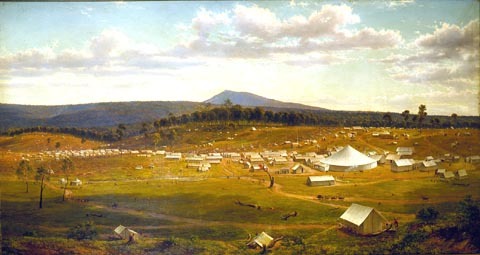 The work was painted from the proximity of Sovereign Hill, with a view towards Mount Warrenheip in the distance. No works can be copied from this site. Permission to publish or reproduce can be sought from the Ballarat Fine Art Gallery. All Rights Reserved medialaunch Pty. Ltd.